This story was amended on May 19 to reflect the fact the last strikes in London were in 1979, not 1977 as originally reported. Tour guides working for Shakespeare’s Globe have staged the first strike to hit a London theatre since the 1970s. The guides, all members of backstage union BECTU, staged a protest outside the theatre on May 18 after months of talks over pay broke down . They have been demanding an increase from £11.24 an hour to £13.50 an hour since the end of last year, alongside further rises over the next three years. The Globe said this amounted to a 20% pay increase this financial year and a total rise of 64% over three years. It is understood the strike was the first to take place at a London theatre since industrial action at the National Theatre in 1979. In 2003, chorus members at the English National Opera staged a strike in protest of planned redundancies. More than 40 people, including guides and supporters of the strike, assembled outside the Globe to hold banners highlighting their demands to members of the public, many of who were turning up at the venue to take part in a tour. Without its guides, the theatre made use of a specially adapted audio guide , offered to customers for the price of £10, a 25% reduction on the price normally paid when guides lead the tours. However, these were not well received by some people who used them. Hans Fetzer, from Germany, told The Stage that it would have been better to have real guides to be able to ask questions to. “If you need special information it’s better to have a real person,” he said. In total, 38 BECTU members who are tour guides at the venue took part in the strike action over the course of the day. 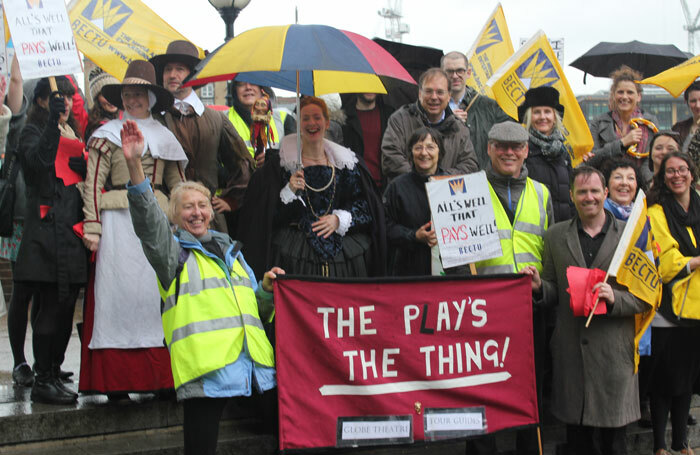 Some dressed up in Elizabethan costumes to make their point, with banners and placards reading: “Much ado about not much more” and “All’s well that pays well”. She also described the audio guides being offered to customers during the strike as “a bland generic product”. BECTU national official Pat Styles told The Stage that it was a “shame” that strike action was necessary, and added that the union’s “door was open” to the Globe, should the venue want to engage in further discussions ahead of another strike planned for June 1. “I hope the management will understand there is a real issue that needs to be addressed, and that it won’t be addressed by ignoring it,” he said. A spokeswoman for the Globe, which has always insisted it has paid fairly and in line with other venues, said all pre-booked groups turned up as planned despite the strike, and that there had been good walk-up business too. The Globe has previously said it would undertake its own pay review in the summer.